Do you own a Boxee Box? If so, you’re in luck, as it’s the newest device we’ve tested with Airfoil, and it works just great to receive audio from your Mac or PC. Sending audio to the Boxee Box didn’t actually require any updates to Airfoil, nor even a download of Airfoil Speakers. This compatibility is available with a simple update to the Boxee Box’s firmware. The Boxee Box: No Stacking! Airfoil sending MOG’s audio to the Boxee Box. The most important result of course is that, audio from your Mac or Windows machine flows through Airfoil and out to the Boxee Box. This works great, and enables you to send any audio from your computer. There are a couple drawbacks, however. First and foremost, the Boxee Box does not play audio in sync with other outputs. If you just want to send from a Mac or PC to Boxee, great. But you won’t be able to include Boxee in a multi-output system if you want everything in sync. That said, the audio plays just fine, so it’s a promising start. 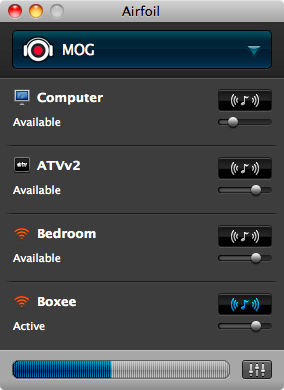 If you’ve got a Boxee Box, just turn on AirPlay receiving, and you’ll be able to send it any audio from your Mac or PC using Airfoil!